This is my first time using no boil lasagna noodles because it is the only kind they had at the grocery store. I have used this technique with regular lasagna noodles and they came out fine as long as you begin and end with a sauce layer. 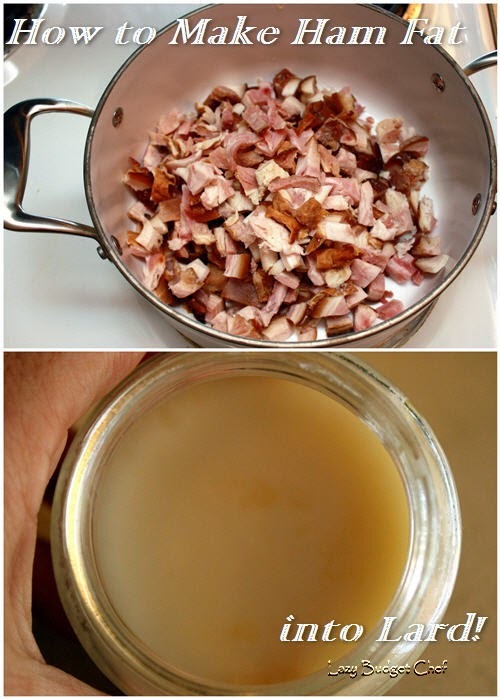 2 Tablespoon olive oil + a bit of oil to keep the onions from sticking to the bottom of the pot when you Saute them. 12 ounces of shredded mozzarella cheese or the shredded cheese mix of your choice. I’m using a mix of shredded Parmesan , Asiago, Fontina, & Mild Provolone Cheeses. How could I resist living vicariously through my lactose loving friends' taste buds? I might have sampled a little bit for quality assurance testing. Great cheese balls! I wish I could eat cheese. So. Good! 1. Peal the skin from the eggplant and slice it. 2. Place the eggplant slices on a baking sheet (I’m using a baking stone.) Brush the eggplant with olive oil and sprinkle it with a short kiss of salt. The salt will draw out the bitterness from the eggplant while it bakes in the oven. The olive oil will keep the eggplant from drying out. 3. 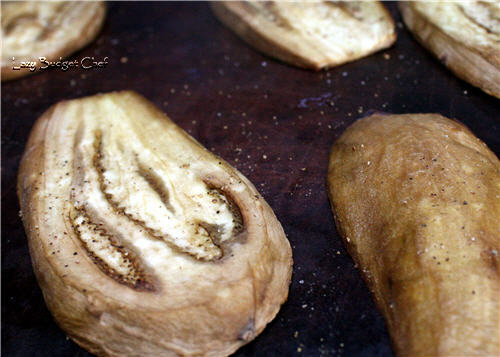 Bake the eggplant in a 375 degree (F) oven for 10-15 minutes until it is tender. 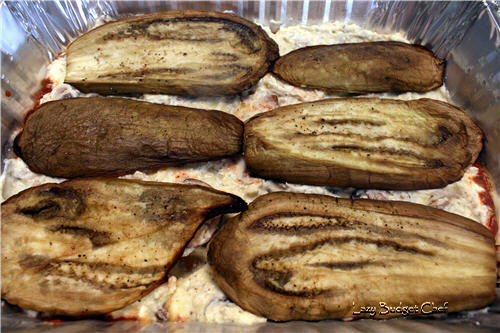 Remove the eggplant from the oven and allow it to cool a bit. When you pull the eggplant out of the oven it should look this, tender but not mushy. 1. Coat the bottom of a pot with olive oil and sauté the onions in until they are translucent. 2. Add the tomatoes, garlic, 2 tablespoons of olive oil, oregano, and basil to the pot. 4. Allow the sauce to and on the stove for 15-20 minutes. Now it is time to build your lasagna by layering the ingredients. Since eggplant likes to take on the flavor of the food you cook with it, I recommend using a sauce layer on either the bottom or top of a eggplant layer for extra flavor but beyond that, stack it how you like and have a ball! There really isn’t a right or wrong layer order other than starting and ending with a layer of sauce. Most of it depends upon preference, or in my case, running out of some ingredients before others. Now you know why my lasagnas have lots of cheese layers and not as many eggplant layers. The first four layers of my cheesy eggplant lasagna. 1. 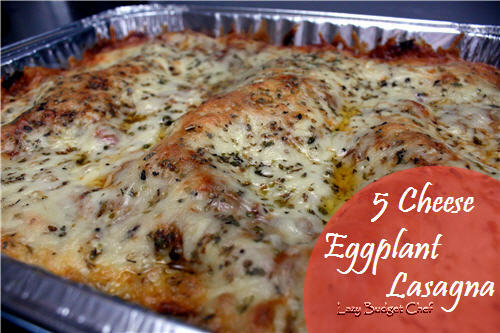 Cover the bottom of a baking pan with a thin layer of sauce. 2. 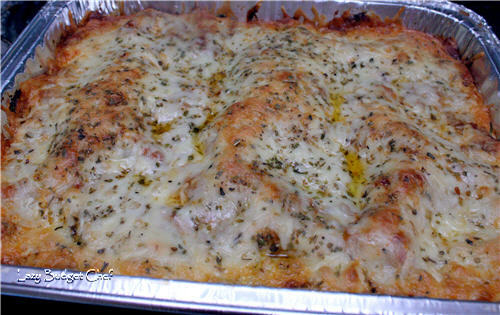 Cover the sauce layer with a layer of lasagna noodles. 3. Spoon a layer of ricotta cheese over the noodle layer. Make sure you cover the noodle layer completely with the cheese layer. 4. Cover the ricotta cheese layer with eggplant. 5. Cover the eggplant layer with tomato sauce. 6. Alternate noodle layer, eggplant layer, sauce layer, and cheese layer until you’ve reached the top of the pan. 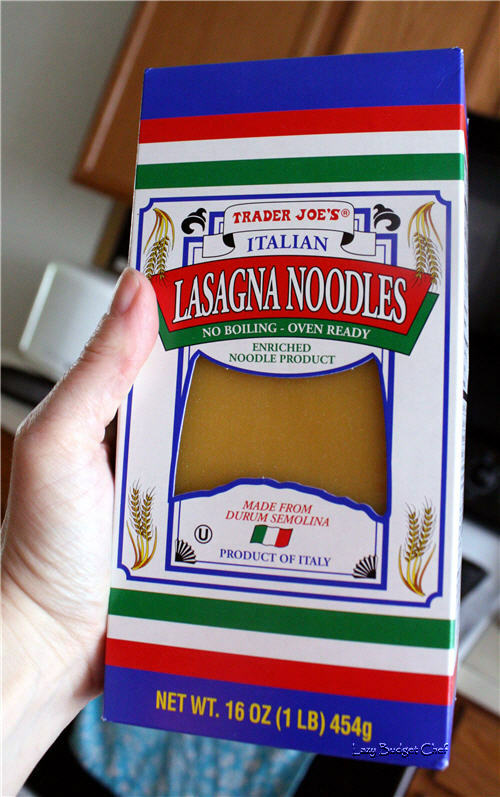 Important: Start with a sauce layer and make sure you end with a sauce layer especially if you did not precook your lasagna noodles. 7. Cover the top of the lasagna with shredded cheese. If you want to add a couple of shredded cheese only layers in your lasagna that’s OK too. 8. 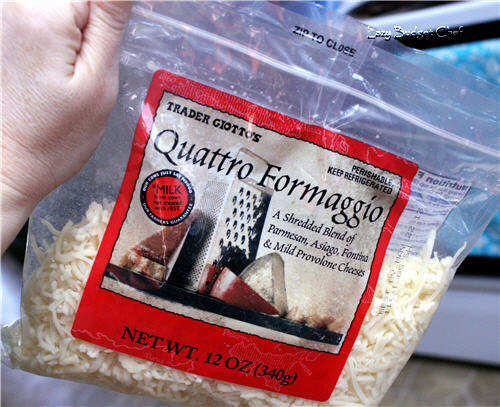 Sprinkle shredded cheese with oregano. 9. 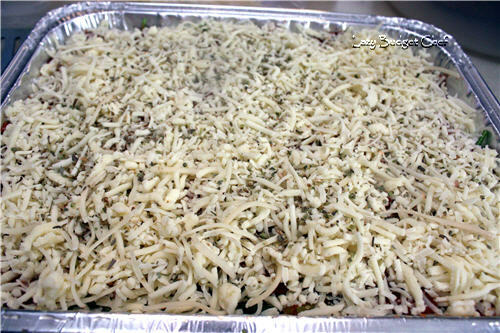 Bake in the oven at 350 degrees for approximately 40 to 45 minutes until the lasagna is thoroughly cooked through the cheese is golden brown. 10. Allow the lasagna to cool and the flavors to mingle like a high class house party for 15 minutes or so. 11. Slice it, serve, sit down, and eat! My apologies for not cutting a slice and taking a beauty shot of the lasagna layers. I thought it would be too rude to give my friends a lasagna with a piece missing. Normally I would deliver the food in a reusable pan. I bought a recyclable pan and lid since I didn’t know what the food situation might be and I didn’t want my friends to worry about keeping track of or trying to return my dish. They appreciated the thought.